Perfetti Van Melle’s Mentos, in its typical irreverent style, has been promoting an 8week contest, with a theme that is in sync with its ‘Dimag ki Batti Jalao’ tagline. 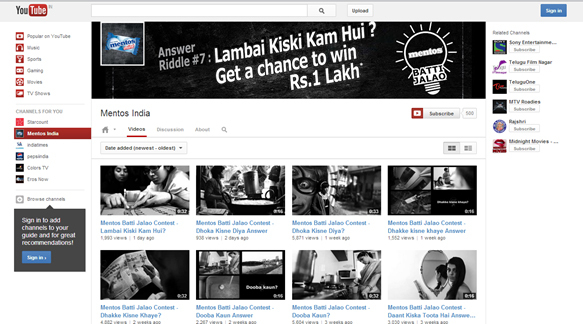 The fun riddles (like Dhakke kisne khaye, Dhokha kisne diya, Dooba kaun etc) are set up as 30 second well-shot, smart videos hosted on Mentos' Youtube Channel. All you need to do is follow the sequence of frames closely, get the cue and crack the answer. Weekly winners stand a chance to walk away with Rs.1lakh! The well-conceptualised and executed contest is already in its 7th week. 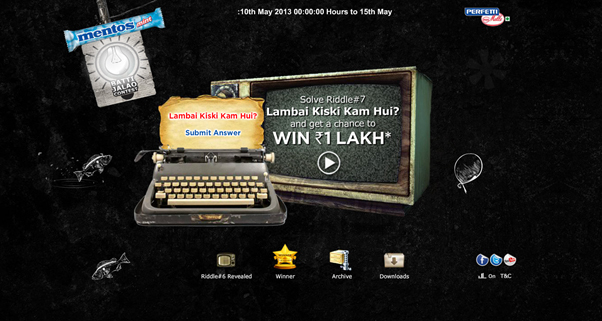 Participants can share their answers on the Mentos India website. The contest is being promoted across Mentos' social media properties including Facebook and Twitter where the brand engages its fan base with similar witty caption contests & guess-the-movie quizzes. Though the idea is great, the web design creatives leave you asking for more, especially the contest page layout which seems disconnected. A little more effort and this could have been a roaring execution.